The 25th of May came and went, and GDPR didn’t stop us all from working, shock horror! However, there are always improvements to practice and systems that we can all make. We’ve been working hard exploring the array of tools on offer to you within the Microsoft 365 platform to offer all of our customers secure email that can be encrypted and restricted. We’ve devised two main options that can be rolled out to your email tenancy that offer peace of mind that the data you’re sharing is safe and won’t end up in the wrong hands. 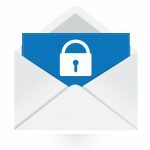 We’ve also written a comprehensive guide demonstrating how to share secure email content with users outside your organisation. These are what it says on the tin; messages are transformed from plain text into unreadable code during its transmission from your computer or device to its destination or recipient’s device. As well as encrypting a message during transport an even higher level of control prevents recipients sharing, printing or even copy & pasting any content. For more information and setup costs, please speak to your regular technician. Microsoft currently does not charge education customers for these tools, and we’ve invested a lot of time in development and testing this solution for you to use, and we’re passing that on for free. These are solutions that need special skills and knowledge to configure and maintain which is why we’ve developed it centrally and rolled it out across the board. We’re pleased with the development work our team have done outside of contract hours, going above and beyond. We hope that you are too.